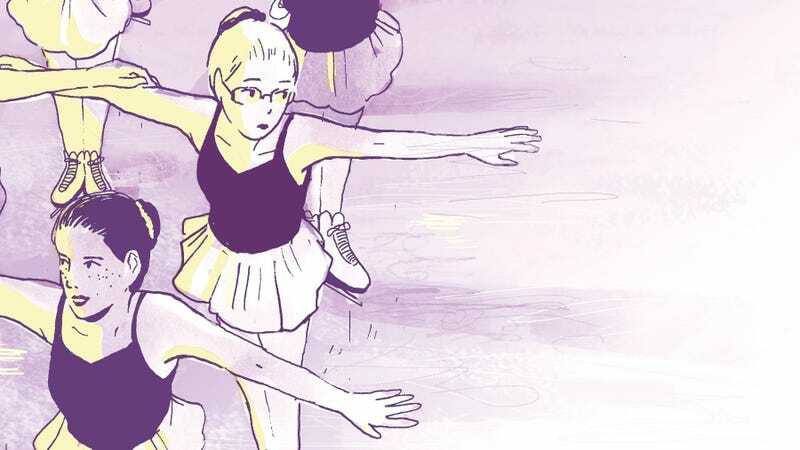 At only 21 years old, Tillie Walden has the potential to be the Next Big Thing in YA graphic novels. She honed her cartooning skills on her Eisner Award-nominated webcomic On A Sunbeam, a Studio Ghibli inspired sci-fi story with a lush, warm visual style, and she’s applying those skills to her personal history in her new graphic memoir for First Second: Spinning. Exploring Walden’s experience growing up in Texas, the book traces Walden’s journey out of the restrictive, conservative world of competitive figure skating during her teen years. She carved a new path for herself as she discovered the liberation of cartooning and embraced her homosexuality, and Spinning evokes the full range of her adolescent emotions with its delicate, lyrical storytelling. This exclusive excerpt from Spinning showcases an integral moment in Walden’s sexual awakening: her first kiss with another girl. These pages are especially impressive in how they create tension. The excerpt starts with the calm of Walden drawing in her sketchbook, presented with predominantly white panels. Once her friend comes over, Walden increases the tension with the contrast of light and dark, and the panels showing the two girls are as far apart as possible. They appear alone in those panels, and their bodies are leaning away on the page even though the final panel reveals that they’re actually leaning into each other. They’re physically close together but mentally they’re still uncomfortable about the situation, but that anxiety begins to dissipate as they follow the instructions of the YouTube tutorial. There’s a huge release when the kiss finally happens, and the starry sky from earlier reappears, the clouds replaced by flames. A new color appears in that moment, followed by an all-white panel that brings back that sense of calm from before. That pale yellow conjures different emotions depending on the context, and while it’s a passionate flame in that first panel, it becomes a slender beam of hope in the splash page revealing the wave of fear that hits Walden after the kiss. Walden does phenomenal work capturing her emotional state in the visuals, and readers can see the scope of her talent by picking up Spinning on September 12.